Baseball fans have seen plenty of talented pitchers toe the rubber on the mound at Seaman Stadium since its opening in 2007, and without a doubt, Andrew Kittredge stood out. In 2017, the now 28-year old right-hander became the second Dawgs alumnus to play in the major leagues when he got the call from the Tampa Bay Rays in July of that season, and saw significant major league time in 2018 as well. Kittredge signed with the Dawgs early in the 2011 season, following his junior year at the University of Washington (NCAA Div. 1; Pac-12) in which he did not play. His goals heading to Okotoks were simple. Kittredge made his first start in a Dawgs uniform on June 24, 2011 at Seaman Stadium, and would go on to make four starts and 10 appearances in the regular season, working to a 3.52 ERA and 26 strike outs in 30 2/3 innings pitched. The 6-foot-1 right-hander reached yet another level in the playoffs, recording a franchise record five saves in the Dawgs’ run to the Western Major Baseball League (now Western Canadian Baseball League) Championship Series. Kittredge, a native of Spokane, Wash., was prepared to head to NAIA powerhouse Lewis-Clark State College in Idaho for his senior year that fall, but another opportunity arose when the Seattle Mariners offered him a minor league contract in late August. Kittredge accepted the offer and began his professional career with the Mariners’ short-season affiliate, the Everett AquaSox. Kittredge pitched six seasons in the Seattle organization, reaching triple-A in 2013, and again in 2015 and 2016. Kittredge said that there was a period of three to four years where he thought he could be released, and remembers a perspective change that started a shift in his career. Kittredge finished the 2016 season with a cumulative 3.50 ERA 72 innings across 37 appearances with seven saves split between double-A and triple-A. That November, Kittredge was involved in a five-player trade between the Mariners and Tampa Bay Rays. After knowing only one organization as a professional, starting anew with the Rays was a new experience for Kittredge. 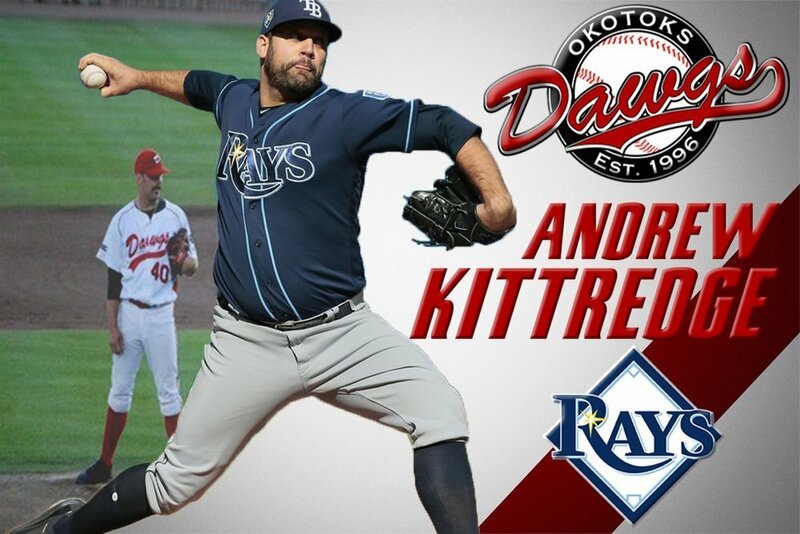 Kittredge was a non-roster invitee to his first major league spring training in 2017, and began that season with triple-A Durham where he had an outstanding start to the season, posting a 1.45 ERA in 68 1/3innings over 41 appearances. On July 17, 2017, The Rays purchased Kittredge’s contract. For Kittredge, it was the realization of a dream he wasn’t sure could still happen. “I had never really believed that I could happen; It was pretty incredible,” Kittredge recalls fondly. When Kittredge’s major league debut occurred on July 18, 2017, pitching 2/3 of an inning in Oakland, he became the second Dawgs alumnus to play in the major leagues, following Jim Henderson in 2012. To say that Kittredge kicked the door down in his entrance to the majors would be an understatement. In 15 appearances for the Rays in his rookie season, Kittredge worked to a 1.76 ERA with 14 strikeouts in 15 1/3 innings pitched. Another first came for Kittredge in 2018 as he cracked his first major league Opening Day roster. After that though, his second season was more of a challenge, as he was optioned back to triple-A Durham and recalled back to the Rays on four separate occasions. Despite the rollercoaster of 2018, Kittredge remains confident heading into 2019. Kittredge is confident that he has much more to give in the major leagues and is determined to show it, but he is not overthinking it. Outstanding talent is on display at Seaman Stadium each summer in the WCBL, and Andrew Kittredge one of its prime examples. From starring in a Dawgs uniform at Seaman Stadium in pursuit of a title for Okotoks, to the realization of the life-long dream of pitching in the major leagues.